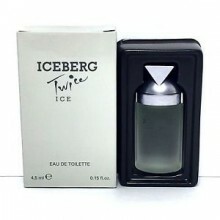 Iceberg Twice Ice by Iceberg is a Floral Fruity fragrance for women. Iceberg Twice Ice was launched in 1998. The nose behind this fragrance is Quest International. Top notes are rhubarb, litchi and bergamot; middle notes are jasmine, lotus and rose; base notes are amber, musk, vanilla and coffee. Click the button below to add the ICEBERG -TWICE ICE EDT Women - 5 ML ( Miniatures ) to your wish list.